I. "Why is there anything?" In 1959 I read Martin Heidegger's "Introduction to Metaphysics," that might have been a mistake; he asks questions you can neither answer nor forget - una maledizione, a curse. According to Heidegger the first question in metaphysics is "Why is there anything rather than nothing?" Martin Heidegger made the Question of Being the foundation for his philosophy, becoming, as George Steiner described him, " the great master of astonishment, the man whose amazement before the blank fact that we are instead of not being, has put a radiant obstacle in the path of the obvious." Such thoughts leads others on: "Does it (something, the universe, existence) make any sense?" "If not, will it every make any sense?" That is to say, with rising consciousness (assuming it rises) and a string of new Einsteins (assuming there will be more), will we someday fathom the mysteries of the universe? Even after the discovery of the Higgs bosom, science may state that things are connected, but we still do not know why the world exists and if it or us have rhyme or reason. In seeking answers, or at least clarification, I'll hold philosophers in abeyance, they are great with questions. Heidegger also said, "Making itself intelligible is suicide for philosophy." Not much help there; but Friedrich Nietzsche will be the exception. Instead, I turn to dramatist such as Shakespeare, thinkers who are also artists. In the west, drama began in Greece and the big three in the classical world are Aeschylus, Sophocles, and Euripides. I'll begin there. In Athens in the middle of the 5th century BC, plays were presented over a period of four days at the feast of Dionysus, god of wine (the irrational, the right brain, wild music, the life force, and so on). The festival was celebrated in Athens around the end of our month of March - spring, when life and Dionysus return. Part of the celebration was the presentation of seventeen new plays performed over four days: nine tragedies, three satyr plays, and five comedies. Here is how it went. 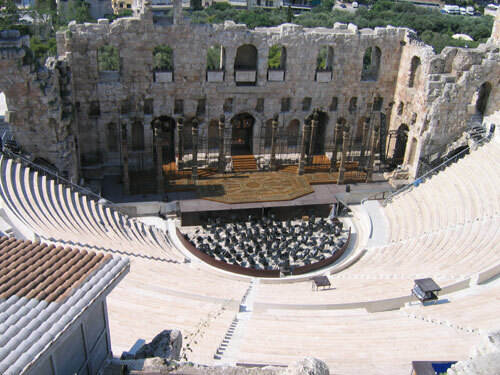 The audience assembled before dawn on each of the four days at the theatron (see image below) and in one day they saw three plays, such as the Oresteia by Aeschylus, followed by a satyr play. Unless an audience member ducked out early, he will not get home until early afternoon. Ducking out was unlikely as the thousands of citizens who attended came in the spirit of religious and civic duty. Rather than seeking entertainment like our taking in a movie, the experience was more like Christians attending a sunrise service on Easter or a solemn Mass. is in better shape that the theatre of Dionysus at Athens. With Shakespeare the dramatic emphasis is on action and character. In Greek drama there is little drama or characterization, half the play is assigned to the twelve member chorus that sing, dance, and ponder the action. Greek drama was a complete work of art combining poetry, drama, dance, music, and painting in an exploration of ethical, political and religious ideas. Aristotle viewed drama, tragedy, as rooted in the fundamental order or disorder of the universe; thus the drama revealed what may happen at any time or place because that is the way the world operates. Tragedy therefore arouses not only pity but also fear, because the audience can envision themselves within a chain of events portrayed - we are part of the forces that ply the universe. At the conclusion of the tragedy there is a katharsis (purgation, cleansing) of the emotions of pity and fear and the audience in tears. As Picasso remarked, "Art is not life; art is a lie which helps us appreciate life." I will add, and endure it. To accomplish all this the Greek dramatist was permitted to use only three actors (all male, and each must play several roles, changing costumes, masks, vocal registers, and style), plus the twelve member chorus. About one third of the play was declaimed, one third in speech-song, and one third in sung coral odes (some sung by chorus and actors together). The singing was likely chanting accompanied by a reed instrument associated with Dionysus, the aulos, which sounded not unlike the modern obo. 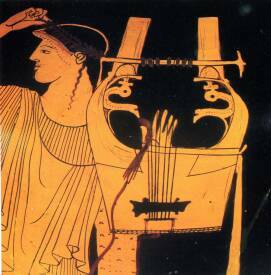 The aulos was fitted with a second reed that acted as a loud drone. 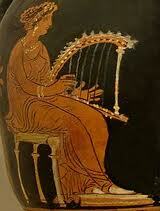 The lyre, associated with Apollo, was also used in some productions, as well as small drums and bells. Aeschylus, Sophocles, and Euripides each offer different answers, or points of view, to the question about the nature of the cosmic forces that drive the course of human events. So, possible answer number one: Chance. The main themes of Oedipus Rex, as you probably remember, are fate and free will, Antigone is, at least on the surface, concerned with the individual vs. the state. In both plays, oracular predictions are ignored, men interrupt women performing religious rites, and the hubris of men unable or unwilling to see the truth leads to tragedy. While the first two plays bring up the theme of a person's moral responsibility for their destiny, and whether it is possible to rebel against destiny, Oedipus at Colonus is the only one to address it explicitly. Oedipus holds that he is not responsible for the actions he was fated to commit. He tells his daughters that their burden of caring for him was over, while his daughters grieve he asks Theseus (mythological king of Athens) to swear not to forsake his daughters. Then Oedipus sends his children away, for only Theseus will know the place of his death, then bathes himself and pours a libations. At the end of the play, a messenger enters and tells the chorus that Oedipus is dead. When the messenger had turned back to look at the spot where Oedipus last stood, he says "We couldn't see the man- he was gone- nowhere! And the king, alone, shielding his eyes, both hands spread out against his face as if- some terrible wonder flashed before his eyes and he, he could not bear to look." This was Sophocles last play, produced when he was 90 years old. 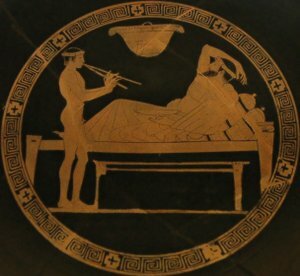 Was Sophocles seeking or anticipating an apotheosis at the end of life for both himself and Oedipus? So, possible answer number two: Fate, with a dash of mystery at the end. As this explanation is more complicated, I will have to burden you, gentle reader, with more details. You may duck out now, or proceed to the next page.